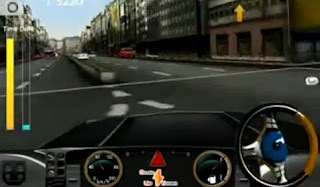 Android App Review - Dr. Driving by SUD. An upgrade of Dr. Parking, this is a very good game with great physics which lets you do one thing - drive! You get to complete missions in very realistically looking city scenes, earn money and then you can buy more expensive and fancy cars. The game is so good it can be used as an aid for car driving lessons but even the more experienced drivers among our testers loved this game. SUD tried and made a very good job in simulating real cars movements - from stops, to accelerations to turning to breaking. It did have some very minor annoyances, such as forcing you to link your Google+ and Facebook accounts and the fact money is not so easy to come by so you have to put in a long time to earn enough to buy the better cars (just like in real life!) but still, our testers all loved this game. Another small annoyance some of our more hard headed testers came up with was rear mirrors and side collisions. The game doesn't have either, so you can make any turns with impunity, which somehow diminishes from the game's fun, at least according to those testers. Score: A very solid and deserving 4.5 out of 5. Just a few small things missing to give this driving game a 5 out of 5. Description: A driving game that sends the user to drive one of a collection of cars through a city in missions to reach a certain place and park there, naturally. The cars behave in a very realistic way and the graphics are great. The game would have been perfect if it was easier to get the new cars and if rear mirrors existed, along with a way to see cars coming from other lanes when you turn. Good Points: Great graphics, at least on a smartphone. Very realistic car behavior, from accelerations to breaks to parking to crashes ... Very addictive and with a simple interface which leaves the focus on the main thing - driving the cars through the city! Bad Points: Okay, just a few minor points in a great game. You cannot look right and left when making a turn which is very unrealistic. What a driver earns in the missions is not enough to buy a newer and fancier car fast - you have to spend a lot of time for it ... There were some issues with the game forcing you to log on to your Facebook and Google+ accounts - which is a behavior we do not like on an app. Very few crashes and bugs - a very stable app. Experience: Our testers all installed and ran this app quickly. The game has a smooth learning curve and even our teen testers got to finish the mission quickly, in some cases faster than some of the older testers with a driving license ... All in all, if you have a relatively new smartphone with updated hardware this game will run smoothly. Longevity: In a relatively rare show of loyalty, all of our testers elected to have the app installed for good. Some are playing it more often than others, but several months after testing begun, none have uninstalled it yet.